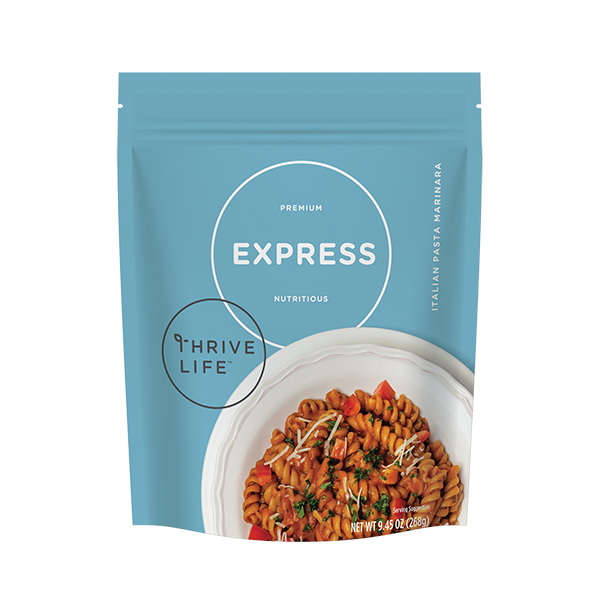 Fused with our Italian Herb Blend and Garlic, and mixed with Tomato Dices and Onion Slices, our Italian Pasta Marinara brings all your favorite Thrive Life ingredients to your dinner table in record time! Rotini Pasta (Durum wheat semolina (enriched with iron (ferrous sulfate) and B vitamins (niacin, thiamin, mononitrate, riboflavin, folic acid)), Tomato Sauce (Tomato Powder, Food Starch-Modified, Sugar, Milk Fat, Whey, Salt, Sweet Cream, Garlic Powder, Onion Powder, Spices, Nonfat Milk Solids, Nonfat Milk, Carrot Powder, Dextrose, Sodium Caseinate, Sodium Phosphate, Maltodextrin, Natural Flavor, Yeast Extract, Citric Acid, Silicon Dioxide (anticaking agent), Annatto Color), Parmesan Cheese Powder (Pasteurized milk, salt, cheese, culture enzymes, disodium phosphate, lactic acid), Onions, Sugar, Tomato Powder, Tomato Dices, Salt, Granulated Garlic, Italian Seasoning Blend (Oregano, Basil, Rosemary, Thyme, Marjoram, Sage, Savory), Peppercorn Blend (Spices, Red and Green Dehydrated Bell Pepper, and less than 2% sunflower oil added to prevent caking). 1. Bring 3 3/4 cups of water to a boil. 2. Whisk in contents of package. Return to a boil. 3. Reduce heat and simmer for 8-10 minutes, stirring frequently. 4. Let stand for 5 minutes. Stir in 2 tbsp. butter before serving if desired. Season to taste.